different approaches, TAURUS can help supply the reliability and consistent dedication needed to help bring ARIES's ideas and impulses to a fruitful completion. Both of you should try to adapt to each other's style in daily events: for example, TAURUS may resist a sudden impulse of ARIES to go somewhere, when joining in the fun would be much more satisfying for both of you. Both of you are very domestic and appreciate the simple joys of life. Others find the two of you to be very warm, friendly, and caring, and your soft and considerate attitude is greatly appreciated by your friends. If you have children, then you are very dedicated and involved parents. The two of you would enjoy living in a quiet, fairly secluded place away from hustle and bustle. CANCER is very emotional, very attached to family and familiar surroundings and easily upset by any form of cruelty; TAURUS's practical, grounded approach to life and gentle manner is very much appreciated by CANCER. TAURUS is steadier emotionally than VIRGO is, and VIRGO appreciates TAURUS's consistent nurturing, healing, and soothing qualities. You share a great interest in food; VIRGO is especially concerned with nutrition and is somewhat fastidious, while TAURUS just thoroughly enjoys it! While SAGITTARIUS thrives on variety, travel, socializing, and exploring, TAURUS is often content to plug away at the same thing day after day, until it nearly drives SAGITTARIUS crazy! In some ways, you are the "odd couple" with opposite traits. Although it is nice to think that your opposite natures can complement each other, the truth is that you may also need to do many things separately in order to be happy with each other, because SAGITTARIUS is likely to become bored by TAURUS's routine and TAURUS is likely to feel very distracted and unsettled from SAGITTARIUS's wide-ranging interests. If you can appreciate and understand each other, you can help add balance to your lives. While TAURUS often takes a practical, down-to-earth, simple approach to life, AQUARIUS is more inclined to take a modern, progressive or unconventional approach. This inclines the two of you to often differ on political and social issues as well as have different tastes in art, music, and literature. AQUARIUS is more aware of modern trends, and stays more in tune with changing styles and current events, while TAURUS stubbornly holds on to the classics. 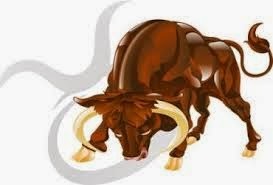 TAURUS's interests are more focused, less wide-ranging, and change little over time. This difference in your approach to life is not likely to create serious problems, but it does tend to be annoying at times. You are both stubborn (TAURUS is particularly stubborn! ), and this can aggravate the problem as you may be unwilling to fully accept and appreciate each other, being unwilling to adapt to your differences. Both of you are basically tolerant, easy-going, "soft" and peace-loving people, and this goes a long way toward maintaining harmony in your relationship. PISCES really appreciates TAURUS's steadiness and dependability, while TAURUS responds to PISCES's gentleness, kindness, and sympathy.